Whenever there is a design that needs to be done for any new project requirement or an enhancement, people always throw up some patterns to be implemented, the first pattern comes out of their mouth is always Adapter, I used to think the pattern seems to be very complex, because everybody use it as a jargon, but the irony is, it is the simplest pattern next to Façade pattern. Let us discuss with a scenario. We need to create two types of report in our project by batch process which runs at night everyday. Part of the problem is that user favorite type of report is saved in the database and developer will not have any control of the report type. Report that needs to be generated is known at run-time based on user choice. We need to adapt two types of report into one type, so we can use it across the layer irrespective of the report type. In this scenario, PDF Report will be created by the open source code which you have control to develop and change the code, change the functionality and development is done by the development team of the company. For Doc report, We use Microsoft office Interop DLL to create the doc report, where you do not have any control over the code. You just have to call the wordDoc.SaveAs (filename). Microsoft dll and PdfReport DLL are incompatible as per our current scenario. Before solving the problem with Adapter pattern, we need to understand the common terms that are used in the Adapter Pattern world. Target: defines the domain-specific interface that Client uses. In our case IReportTarget is our Target. Client has defined an interface for creating report. Adaptee: defines an existing interface that needs adapting. In our case it is the Microsoft Office Interop dll which needs to adapted. Client: One that consumes the Target. The above code exists because the Microsoft.Office.Interop.Word, is not compatible with IReportTarget. 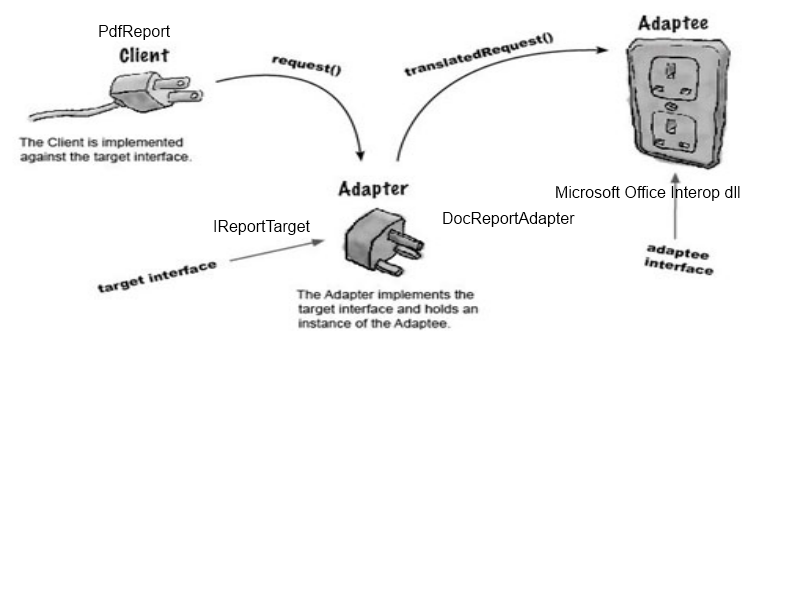 Let’s make the document of Microsoft.Office.Interop.Word compatible with adaptee, so we can use to be compatible with all reports. If we have another type of report that is needed in our project, we need to just implement the functionality in a separate class file encapsulated and then implement with IReportTarget, so it will compatible with existing reports. Try these examples with a class project in .Net or Java and understand all the keywords such as Adapter, Adaptee and Target. You can also define your own scenario, where it will be more easy to understand, This is the simple of all patterns, Try and let me know your comments.